There has been a lot of confusion lately about what the word "feminism" means. Though feminists repeatedly insist that their goal is gender equality, critics continue badgering them with accusations of hating men, reinforcing the gender binary, and pursuing other things "feminism" does not mean. So, since we've already stated what feminism means again and again (short answer: It can mean a lot of things, but what it mostly comes down to is equality and being able to make the choices that are right for you), it's time to clear up what it doesn't. First, in case you don't know the actual definition of feminism, it is "the advocacy of women's rights on the grounds of political, social, and economic equality to men," according to Google's dictionary. I'll admit this definition leaves something to be desired; modern feminism, for example, acknowledges more than two genders, so the movement is not just about advancing women. In addition, many have critiqued the notion that marginalized genders should aspire to assume the male gender role in our current society, since much of it is built around toxic masculinity and exists within a patriarchal system that should perhaps be dismantled altogether. But what's not wrong with this definition is its focus on equality, not female superiority, sameness, or any of the other things people sometimes think of when they hear the word "feminist." So in the name of clarity, here are a few things that the word "feminist" does not mean. 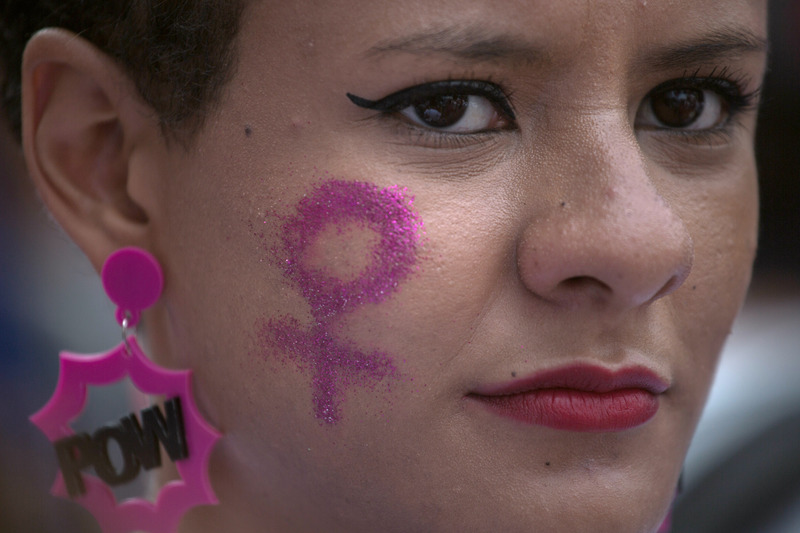 Feminism has often been misread as a celebration of womanhood. But that would defeat the purpose of feminism, which is to challenge the notion of "womanhood" altogether. If you look at femininity as a social construct, there is not too much to celebrate. Yes, women have certain advantages, like the opportunity to be more open with their emotions without judgement, but overall, being a woman means being economically disadvantaged, being at higher risk for sexual abuse and intimate partner violence, being denied basic human rights in many places, and a slew of other negative things. Furthermore, traditional gender roles in general serve to stereotype and limit people. Identifying as a feminist not saying that being a woman is great or better than being a man. It's saying that being a woman or gender non-conforming person should be as good as being a man, but currently, it isn't. Since feminism is against gender stereotypes, generalizations like "men are bad" would actually fall under the category of "anti-feminist," since it is itself a gender stereotype. In fact, the cultural views of men as more aggressive, impulsive, and cold are just a few of the stereotypes feminism aims to combat. What feminism does acknowledge is that men (not to mention white people, able-bodied people, and other advantaged groups) have privilege, and that this privilege can be used for good or for bad depending on your choices and behavior. When people use their privilege to assert their power over marginalized people, we're allowed to call them out. The focus of any social justice movement should be to help those who are most harmed, not to protect the egos of those who benefit at the expense of those who are most harmed, after all. This says nothing, however, about how men innately "are" or "should be.' The currently state of the world is one in which men have more power, and it is one we aim to dismantle — not in order to hurt men, but in order to free people from stereotypes and expectations that harm everyone. 3. That Feminine Things Are "Bad"
In a feminist utopia, nothing is considered masculine or feminine. You can like cars or dresses or pink or blue without any assumptions being made about your identity. So, feminism is definitely not about saying that dresses and pink and everything else we code as feminine is "bad." It's about saying that these things are not inherently associated with women at all. In fact, it's also about acknowledging that these things have been devalued due to their association with women, but shouldn't be — people tend to mock things and people for being feminine, and we should be suspicious of that fact. This means that feminism tries to balance out societal views of "feminine" and "masculine" things while acknowledging that there's no reasons these things should be gendered, or valued based on the gender we assign them, in the first place. If a woman wants to wear pink and be a stay-at-home mom, that doesn't make her less of a feminist. If she dislikes pink and wants to devote her life to her career, that shouldn't either. The whole point is to stop associating these traits with gender, and to stop judging their worth based on the gender with which we associate them. Feminists are sometimes accused of trying to make humanity homogenous by getting rid of gender roles, and if your view of diversity means dividing people into two groups and two groups only, then maybe feminism is challenging that. But that's not how I want to conceive of diversity. To me, heterogeneity means endless groups of people — women of color, men who like "feminine" things, women who like "masculine" things, non-binary people, otherkin, you name it — not just "men" and "women." Rather than viewing men and women as completing humanity by playing complementary roles, feminism often views this gender system as actually flattening out humanity by making it into only two things. If people want to be masculine or feminine, that's fine. If the stereotype of the gender you were assigned at birth perfectly fits you, go for it. But you shouldn't feel any pressure to perform in any one way just because our patriarchal society says you should. And when people don't feel this pressure, the world just doesn't divide itself up into two neat categories — and that's fine. Oh, how it pains me to have to say this, but apparently it needs to be said (which, honestly, is all kinds of messed up.) So let's get two things cleared up: First and foremost, being LGBTQ is not bad or negative; and second, there is actually no relationship between being a feminist and having a specific sexual orientation. And yet, a favorite accusation lobbed by anti-feminists at people who identify as feminist is that they're gay, with gay being meant as an insult: Feminist women are sometimes accused of being lesbians because of that good old man-hating, unfeminine stereotype, while feminist men may be accused of being gay because it's considered a "girly" thing to care about and a threat to masculinity. This is, simply put, BS. Someone can be gay and be a feminist, and certainly being gay may inform that person's feminism; that's what we call intersectionality. However, being one doesn't necessarily preclude the other. And again: "Gay" is not OK to use as an insult, and "feminist" is not a dirty word. Some people argue that by calling themselves "feminists" rather than "equalists" and bringing attention to the way people's experiences differ based on gender, feminists are actually reinforcing gender rather than striving toward a post-gender society. But here's the thing: There's a huge difference between saying that gender influences how people are treated and hence impacts our daily lives, and saying that gender is universal, never-changing, and scientifically justified. Feminists may have differing views on what gender is, but most of us can agree on is that nobody should feel like they have to behave a certain way because of their gender. We can maintain this belief while acknowledging that we live in a world where gender is very, very real. A post-gender society (or at least a post-compulsory-gender society) would be great to live in, but we can't pretend that exists already. There's a yikes-ton of work to be done before we get there, and part of doing that work is acknowledging reality. 7. That It's Just Another Word For "Complaining All The Time"
First of all, when someone accuses feminists of "complaining," I wonder, have they seen the world? Because there's a lot to complain about. Calling feminists angry or negative just fuels a stereotype that discredits them for bringing up valid problems. Secondly, though — and perhaps more importantly — we don't just complain. Feminism can make people laugh, inspire people, and give people a lot of hope. Feminism is the reason why we can vote, advance in the workplace, take action if we're mistreated, expect sexual partners who understand consent, and do many other things we couldn't previously do. And that's something to celebrate.